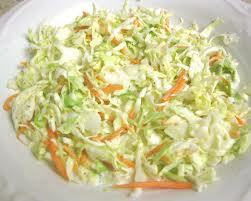 slaw is very difficult to get right. It’s a bold move on my part to post a recipe, because you really need a well developed palate and feel for flavor balance to make this just right. The recipe, per se, is not exact and cannot be followed to a T. This, by no means, isn’t to say you can’t make this recipe to perfection. It means, you may need to ‘tweak’ the recipe slightly, to get it just right. But the basic format will get you close. The base of cole slaw is a shredded pickled cabbage mix. Cabbage, carrot, and onion, all shredded and pickled. Pickling, of course, is a preservation method in which your main item (in this case the vegetables) are in some way dehydrated and cured. There are several ways of doing this, the most common is through a mix of sugar, salt and vinegar. Pickling items for flavor implores a sweet/sour flavor profile, which we, as consumers, love so much. It’s the balance that becomes difficult. You need to add just the right amount of salt, sugar and vinegar, without under or over seasoning, to get the pickling mix correct and the sweet sour ratio just right. So again, in principal cole slaw is simple, but in practice, it can be tricky. Similar to my bbq sauces, I like the cole slaw a little on the sweeter side. I therefore add a little more sugar to the ratio. If you like, for example, a more authentic Polish cole slaw, ease back on the sugar and go a little heavier on the vinegar. I think my cole slaw is somewhat ‘traditional American’ and meets a certain expectation. There are a couple of tricks and pointers I’d like to mention before getting into the recipe itself. First, after pickling the vegetables, let them sit for about 1 hour. This gives them time to pickle thoroughly and expel whatever liquid they are going to give. Next, before mixing any mayonnaise into the slaw, drain the vegetables! This means squeezing the vegetables and ensuring they are as dry as possible before moving to the next step. And third, go light on the mayonnaise. Mayonnaise adds a bit of creaminess and consistency to the mayonnaise, but no real flavor. The flavor comes from the pickling. So you will only need to add enough mayonnaise to reach the desired consistency. And now that you’ve removed as much liquid as possible from the vegetables, this should only require a small amount. This is classic cole slaw. Good for any bbq, any summer meal, to put on any deli sandwich, or good for any time you feel like having a delicious snack! Using a cheese grater, grate the cabbage, carrots and onion into a large mixing bowl. Add the salt, sugar and vinegar and mix well. Taste the mix. It should be a nice balance of sweet, salt and sour. If you need it sweeter, add a little more sugar. If it isn’t acidic enough, add more vinegar. If it lacks flavor, add a little more salt. Keeping tasting it until you are happy with the balance. Cover and refrigerate for 1 hour. Have another mixing bowl ready. Transfer the vegetables from one bowl to the next, making sure to thoroughly squeeze any liquid out of the vegetables. Mix in the mayonnaise and pepper thoroughly. The cole slaw is now ready. Refrigerate until ready to use.